From left to right: Short Sleeve RICCIO Silk Shirt made in Italy; Coffee Brown Viscose ¾ Pants with Belt made in Italy; Bronze & Leather Snake necklace Handmade in Italy. Medium size two-handles Brown Leather zip closure Handbag with interior zip closure side pocket Handmade in Italy; Very Spacious Beige Leather & Fabric Backpack made in Italy. Sleeveless Fantasy Viscose Blouse made in Italy; White Pure Linen Skirt made in Italy; 100% Cotton Orange Hat made in Italy. 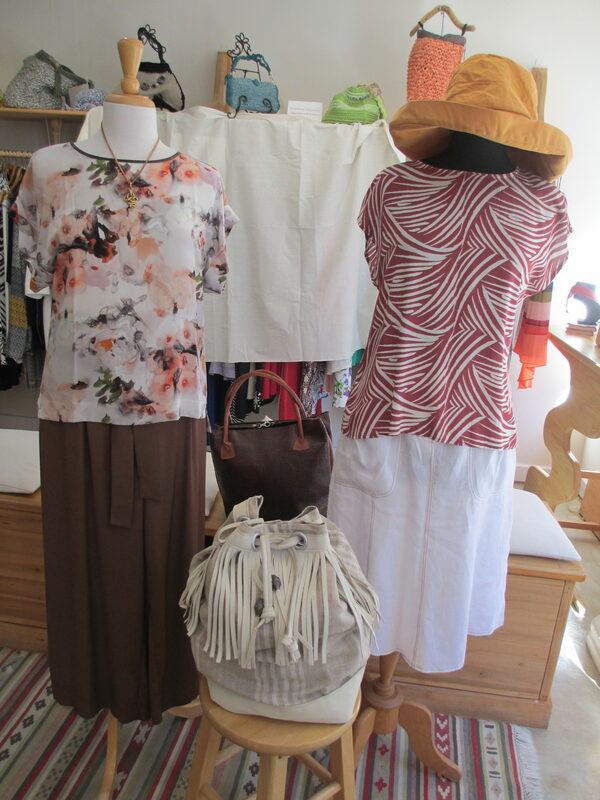 ← Here’s a Sneak Peek of Some Italian Designer Clothing On Sale In Our Boutique!